A geode is a (mostly) round rock that, when split open, reveals a hollow cavity lined with crystals. This multilayered soap cleverly mimics a natural geode, with a colored outer shell, an interior layer of a second color, and clear geometric soap “crystals” sprinkled through the center to add to the realism. A unique and beautiful gift for your favorite rock hound – if you can bear to give it away – this looks startlingly like the real thing. In fact, when we took them to a market, most people thought they were actual rocks – high praise indeed! Net weight: Total weight approx. 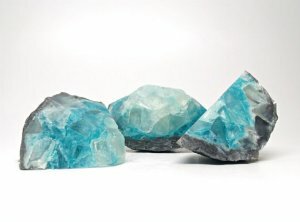 6.5 ounces, typically 3 pieces (varies depending on size of pieces); each piece 2" - 2.5"
Notes: Not to be confused with Blue Topaz Geode Set, which is much more turquoise in color.